The death of books and physical print has been anticipated for some time – as digital mediums take ever-increasing bites from all areas of media with online publishing and archiving, digital libraries, and electronic media readers accelerating the transition from ink and paper to LCD screens. It’s sometimes easy to forget that the modes and materials of media publishing have always been transforming in accordance with the technological, political and cultural movements of the time. 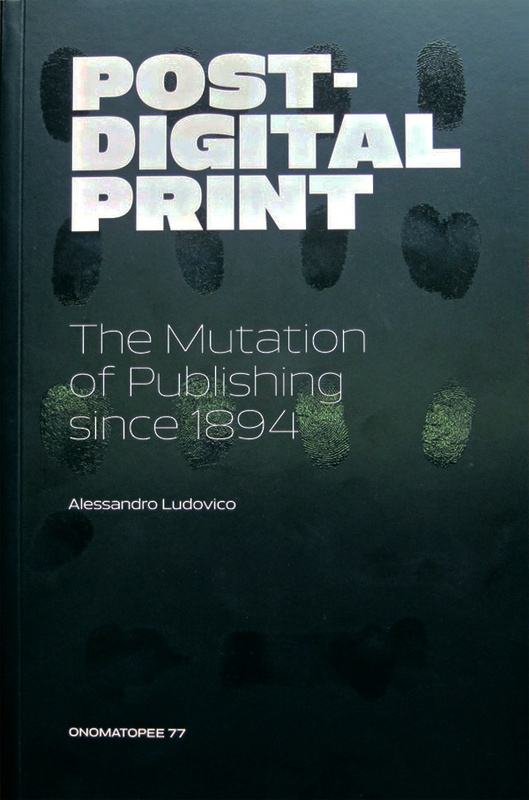 In Post-Digital Print the author investigates the intriguing historical relationship between paper and pixel, their similarities and their differences, exploring the strategic use of print by avant-garde culture and experimental literary movements. The book reminds us that the telegraph, telephone, gramophone and radio have all threatened to supplant print – and unsuccessfully! More so, some of the speculative machines of the Victorian age have actually predicted the invention of e-books and reading devices so commonly in use today. The book, the result of a three-year fellowship at the Willem De Kooning Academy, explores the past to hatch a trajectory of future predictions such as the probable rise in remote printing and networked collaborative distribution. Ludovico is asking big questions in this context – what are the social implication of these new post-digital modes of distribution? To him “One of the strongest values of publishing is to develop content that can serve a community and preserve its values, intellectual elaborations and history”. Is the death of print still a pertinent question? Ludovico feels that this question might be a moot one, perhaps ideological, and insists that there is a ‘false opposition’ between pixel and ink. We should, instead, explore how traditional print and digital publishing can augment each other using hybrid strategies. This dynamic symbiosis might be explored by the recent rise of DIY zines or print-on-demand editions – both utilise digital technologies to generate and distribute physical objects. Ludovico has seen the online publishing phenomena unfold completely in the last two decades, together with his experience in editing Neural magazine. He tells this fascinating story in a richly illustrated, highly readable and enjoyable book.